Set up the ability for your authenticated players to buy and consume Virtual Goods. Retrieve a list of exactly what Virtual Goods your authenticated players have in their inventory. 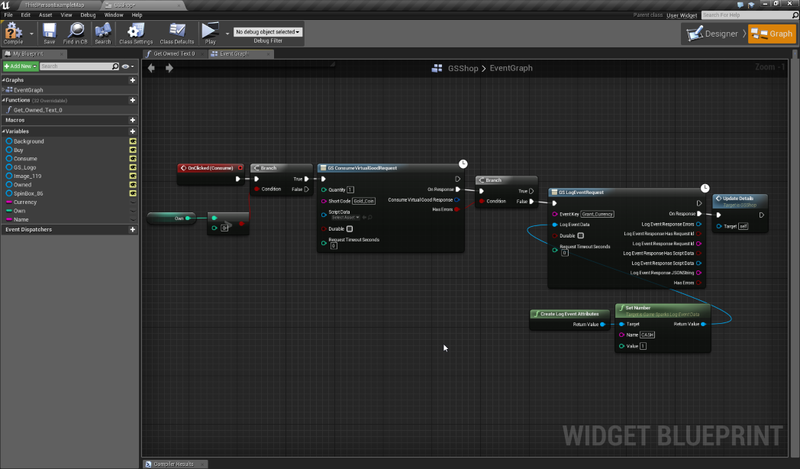 Make a shop screen for the user to buy and consume Virtual Goods. The shop needs to update a player's Currency amount and the number of Virtual Goods they own. Use a GS BuyVirtualGoodsRequest node to purchase Virtual Goods by passing in the Currency type, quantity and the Short Code values. Immediately update the details of the authenticated player. 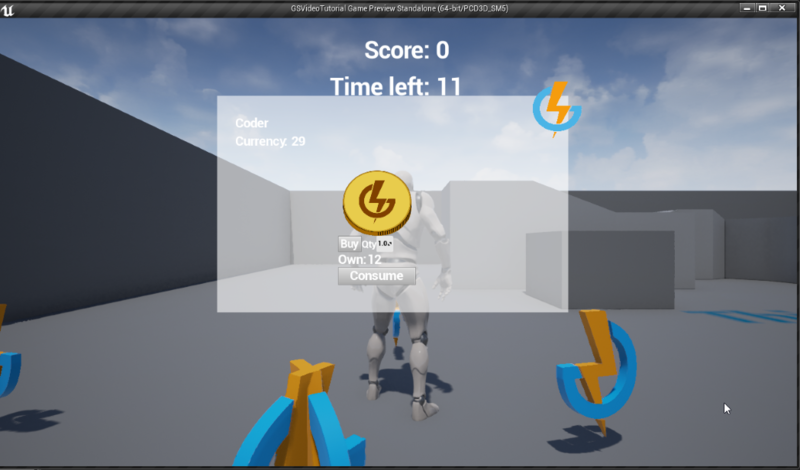 Use a GS ConsumeVirtualGoodRequest node to consume Virtual Goods by passing in the quantity, and the Short Code values. Log an Event called Grant Currency to credit the player with extra currency by passing in the Cash attribute. Click the buy and consume buttons to change the currency and the number of Virtual Goods owned. Ensure that details are being correctly updated. 3. Edit the Event to add an Attribute that will be used to indicate the amount to credit. 5. 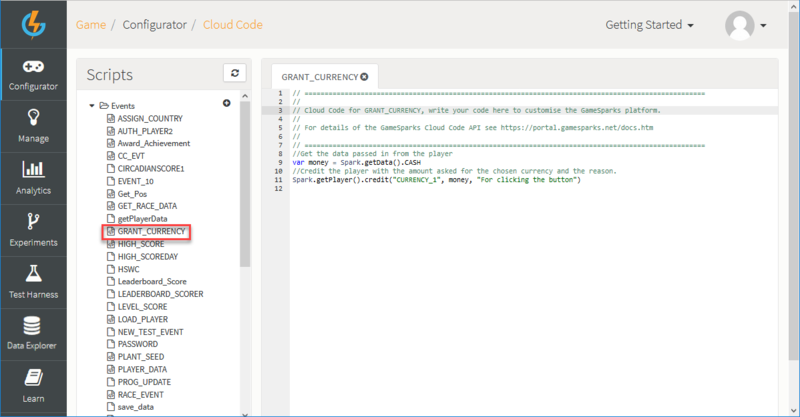 Select the GRANT_CURRENCY Event to open the Cloud Code Editor. In the Cloud Code Editor, create a variable that holds the amount being passed in the Event through the CASH Attribute and call it money. 8. Create a shop screen in your game, with one item for sale - the Gold Coin. The authenticated player is going to have the option to buy and consume gold coins. The player will also be able to see how many Gold Coins they have in their inventory and how much currency they hold in their Currency1 slot. When the player transitions to the shop screen, the values for the player's Display Name, Currency, and the amount of Gold Coins owned need to be updated. 9. To update the values, request them using GS AccountDetailsRequest node. When the Buy button is clicked, a Gold Coin needs to be purchased. 11. To buy a Virtual Good, call the BuyVirtualGoodRequest node which takes the type of currency, quantity, and the Short Code for the item being bought, which in this case is Gold_Coin. 12. After the player has purchased a Virtual Good, update their details so they are aware of the change. Check to see if the player has Gold Coins to consume. 13. If the player has enough Gold Coins, call the GS ConsumeVirtualGoodRequest node, which takes a quantity and the Short Code of the Virtual Good. The ConsumeVirtualGood Event automatically decrements the overall quantity owned in the player's inventory. 14. After the Gold Coin is consumed, log the Grant_Currency Event to accredit the authenticated player with a value of 1 passed through the CASH Attribute. If the authenticated player uses the shop they should be able to buy and consume the Gold Coin Virtual Good and see their information update correctly.